To approve a permanent amusement rides complex as part of the design for the north bank of Riverfront Park. Against: Nick Sumner, Chris Wright, Ted McGregor, Greta Gilman, Gerry Sperling, Sally Lodato, Jamie SiJohn. 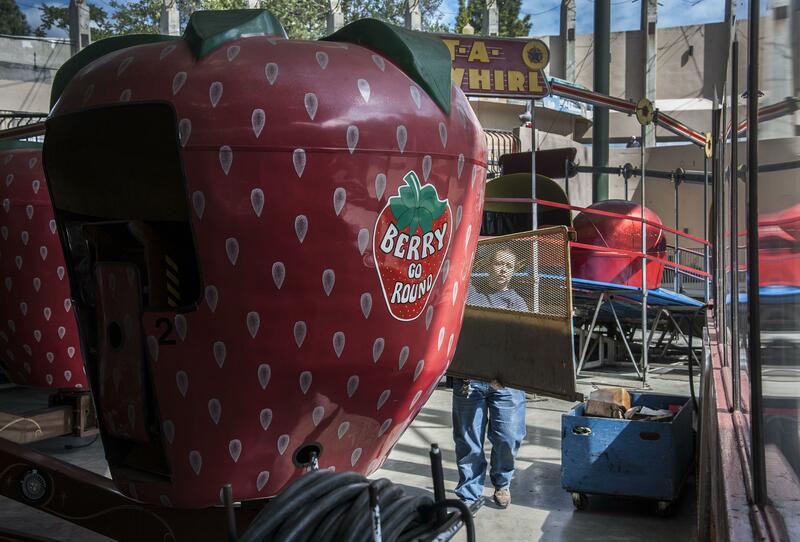 Amusement rides will not have a permanent home in the north bank area of Spokane’s Riverfront Park, after officials shot down Thursday a potential last-ditch effort to include attractions in the redesigned park. The Spokane Park Board voted 7 to 3 against including a permanent ride complex in the design for the park’s north bank, a gathering area north of the so-called blue bridge linking the Spokane Arena with the U.S. Pavilion. A report generated internally by the Spokane Parks and Recreation Department urged board members not to approve such a complex, with estimates the facility and rides could end up costing the department more than $750,000 over a 20-year period. “There is a net loss, and likely an ongoing subsidy, for our parks fund for the foreseeable future. The next 20 years, at least,” Jonathan Moog, director of Riverfront Park, told the park board at its monthly meeting Thursday afternoon. Hal McGlathery, the former Riverfront Park director who had lobbied for inclusion of rides in the future park, conceded defeat Friday, saying the issue was effectively dead. He has dissolved the nonprofit he created to advocate both for the retention of the rides as well as saving the IMAX building, both unsuccessful efforts. Park board members said they weren’t swayed by the financial figures, instead agreeing with the findings of a 2014 plan for the park’s redevelopment that recommended against amusement rides due not only to cost but also compatibility with the future park. Moog said Riverfront Park already has several affordable options for families, including $2 Looff Carrousel rides and free skating days on the new skating ribbon, with plans to offer even more. The Park Board had already agreed with Moog’s assessment this summer that new rides would need to be purchased if they were to return to a redeveloped park. They had agreed to McGlathery’s suggestion to re-evaluate the feasibility of adding rides back into the park, but only if they were bought new. Last week, eight of the former Riverfront Park attractions that had been placed in storage were auctioned off at Reinland Auction House in Post Falls. The business said it could not disclose how much was paid for the Sizzler, Tilt-a-Whirl, Dragon Coaster and other rides, nor could they reveal a buyer. But the business did confirm all of the attractions put on the block by the city were sold at auction Sept. 8. Moog said Friday the city was under pressure this year to get the rides sold as construction begins on the north bank. The maintenance facility where they’ve been stored will be torn down as part of that work, and the prime season for selling used amusement rides falls at the end of summer, after the seasonal carnivals are wrapping up for the year. “The timing is important,” Moog said. Efforts to attract sellers outside of an auction didn’t pan out last year, he said. Any money raised by the sale is supposed to go into a separate city account “to be used as needed for the purchase of ride(s) or other recreational amenity at Riverfront Park in the future,” according to a resolution the Park Board approved in May 2017. Moog said the city had not yet identified where the proceeds of the sale would go, but could be used to reimburse the park’s general fund for renting out the Spider Jump on the skating ribbon this summer or for other amenities. The three board members who voted against nixing the plan for a permanent rides complex said they believed attractions should be a permanent fixture in the park, despite Moog’s suggestion that the department could contract with a traveling carnival company to bring rides back temporarily to the U.S. Pavilion each year. City Councilman Mike Fagan said he’d be asking his fellow legislators at City Hall whether they could support dedicating some municipal funds to support the return of the rides. “Regardless of what happens here, in the next couple of minutes, I’ll be reaching out to my council colleagues,” Fagan said, before the panel voted against a permanent rides complex. But a majority of the Park Board sided with Moog and Parks Director Leroy Eadie that the permanent rides complex wasn’t consistent with the future plans for the park. They also dismissed Fagan’s suggestion to delay a decision for a month so he could lobby supporters on the council, citing the recent selection of a design team to begin work on a playground concept for that area of the park. Park staff said such a delay could push the opening of the playground into 2020, instead of next fall as planned.